There was a much talked-about exposition in the NoordBrabants Museum in ’s-Hertogenbosch (The Netherlands) this year (2017). It showed works by modern and contemporary Dutch artists inspired by the traditional Catholic statues of Christ and the saints. The curators, art historian Joost de Wal and artist Wout Herfkens, took the work of pioneer Jacques Frenken as a starting point. He was the first artist in the Netherlands who in 1965 started to alter and reconstruct dumped devotional objects and hide layered messages in the mass-produced plaster statues. Soon enough this was recognized as modern iconoclasm. He was criticized especially – and not surprisingly – by Catholic believers. These sculptures had often been the genuine centre of rituals and devotion in Catholic houses until they were thrown away as a side effect of secularization. The reuse of objects in art is not a new idea, think of Marcel Duchamp's readymade. But no one applied a saw to an image of a saint or put nails in it like Frenken did. Yet through his ironclad compositions he tells a lot about the cultural context of the 1960's. 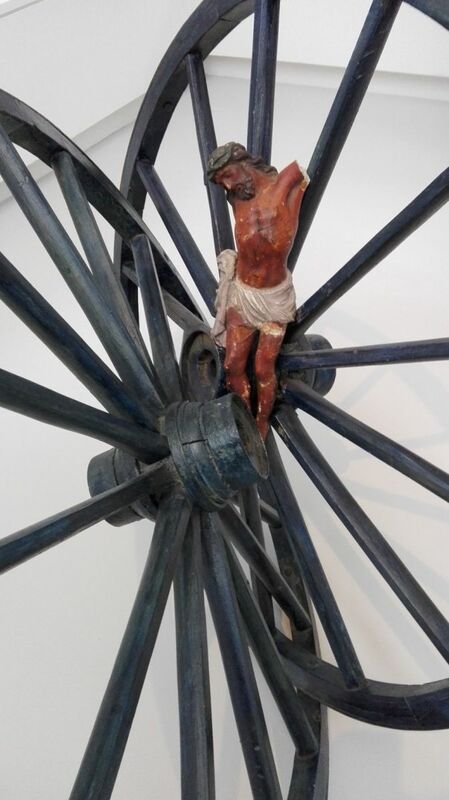 On the one hand he criticizes the trivial and kitsch in religious objects, on the other hand he handles the subject with respect and sensitivity (despite the saw and nails). Frenken says (quote from the catalogue): "I have brought the [spurned] statue back in our midst and accentuated the pain it exudes with nails. With this I invoke the fierce emotions people try to renounce." The Madonna and child covered in nails makes their future pain almost tangible, while Frenken also makes visible the many prayers people prayed inspired by this sculpture. In this way he renews the original meaning of the iconic image and frees the object from its factory-made appearance. Another example is his Franciscus, sawed to pieces yet carefully encased and accompanied by countless stuffed birds. As if Franciscus’ life’s work has been revived as well as immaculately catalogued and stored away once again. I hope that people who see this work of art get inspired to read about him as his message is urgent as ever. The next section of the exhibition showed art from the 1980's and 1990's, the years of criticism of religion, mass culture and consumerism. Artists also questioned the credibility of Christianity. Several examples of colourful visual narratives are to be found here, for example Red onze zielen (Save our Souls) by Rudolf Holleman and Fons Schobbers' Balance. How beautiful this must appear to him who understands it (1986) by Henk Visch was one of the most impressive works for me in this section. "A broken and battered corpus is ground between two interlacing cartwheels," reads the sign: food for thought about the glorification of the horrors of Christ's martyrdom. This work was the bridge to the third section that showed art made after 2000. In the 21st century artists pursue constructive meaning rather than deconstruction. The old purposes of devotional objects are examined by open-minded and curious designers not burdened by dogmatic religion but rather seeking authenticity of faith. Old answers are reconsidered: can these objects give us counsel and direction? In our fast existence we reach out to centuries-old symbols to investigate how forms, so burdened with content, might say something new for our times. It is fascinating to observe personal discoveries. At the same time it is exciting to realize how our society – with artists in the avant-garde – rediscovers and reconsiders its Christian roots. Most contemporary art in the exhibition is based on the reuse of corpuses instead of statues of Mary and saints. Could the reason be the secular or protestant background of the presented artists, even if they are not religious themselves? Or is the image of the last remaining overall recognizable biblical figure in our secular age – the crucified Christ – the epicentre of the holiness artists want to examine? The crucifixion can refer to the violence of our own time, for example in the work of Jan Tregot or in Jeroen Heesters Our nature. Other works such as Perseverance by Marijn Morée and Wout Herfkens' Uit de mijn or Jésus à l’Hôpital challenge the spectator in other ways. Imagine, you see all the wasted crucifixes in charity shops and junk sales and you feel compassionate about them. Wout Herfkens buys them, takes the Jesuses from the crosses, cleans them lovingly, binds their wounds and lays them down on custom made beds. For years he has been working on this series called Jésus à l’Hôpital. There are more than 60 corpuses in his sick-bay by now. A touching idea, funny and serious at the same time. Does he perhaps want to help the Jesus figures get better? Or does he want to honour the suffering? Or grant them some well-deserved rest? For centuries crucifixes were the centre of interiors, today they are thrown away en masse. The average Dutch citizen hardly knows the history and meaning of this crucial image, while Christianity itself is busy reconsidering its own relevance. Herfkens’ compassion makes us consider our relevance in today’s cultural context. His work is not only an act of sympathy, a gesture of thanksgiving or perhaps an expression of sorrow about the course of our culture. It expresses the desire to help things change. What does Christianity have to say to our day and age? Has perhaps the time come that the emphasis on the death of Christ should shift to an emphasis on the resurrection? Christianity, awaken! 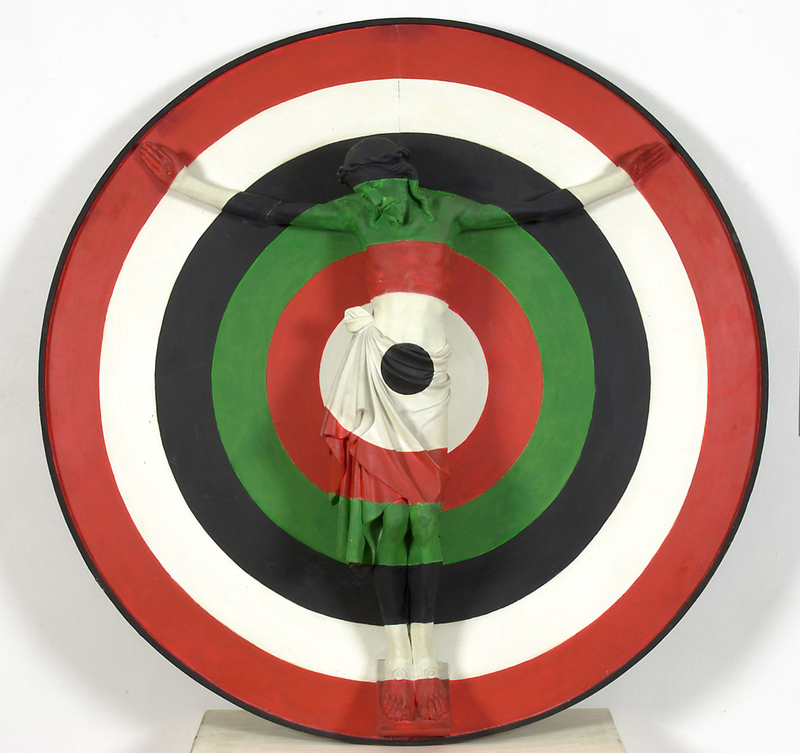 Jacques Frenken: Crucifix / Target (1966) wood, paint, plaster (corpus, ca. 1900), Ø 133 cm. Photo NoordBrabants Museum. Jacques Frenken: Nail Madonna (1968) wood, iron, plaster (Madonna with Child, ca. 1900), 102,5 x 49 x 22 cm. Photo NoordBrabants Museum. Jacques Frenken: Francis of Assisi (1966) wood, paint, stuffed birds, plaster (icon, ca. 1900), 148 x 40 x 34 cm. Photo NoordBrabants Museum. Henk Visch: How beautiful this must appear to him who understands it (1986) wood, plaster (corpus 20th century), 130 x 120 x 70 cm. Photo Aniko Ouweneel. Wout Herfkens: Jésus à l’Hôpital (2014-2016). Photo website Wout Herfkens.